Till May 2005, Benriach was for me just a name of a Speyside Distillery, where I tasted a few recent OB’s, but nothing to fancy for my taste. Well, the Old Greeks where saying “Panta Rey” (Everything is Flowing) that means that everything in life is undergoing changes, so my Opinion too about Benriach should change drasticaly ! The reason and the beggining of this change was a Trip to Scotland in May 2005 and a visit to Benriach and Billy Walker, with Mario Prinz from Potstill Vienna. When we arrived at Benriach, someone was already waiting for us outside the Distillery, a very sympathic and friendly guy who welcomedus and introduced himself as Billy Walker (at this time i didn’t knew who he is or what he’s Job at the Distillery). 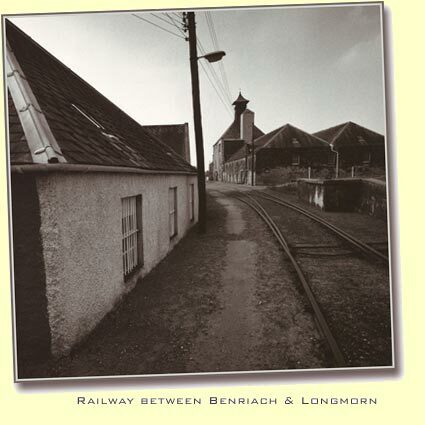 1898: The BenRiach Distillery is established by the Grant Family on the same site as the Longmorn Distillery. Indeed, locally BenRiach was sometimes referred to as ‘Longmorn 2’. However, the timing proves to be unfortunate, preceding the ‘Pattison Crash’ by just a few months. ‘Pattison, Elder and Co’, fronted by Robert and Walter Pattison, were the biggest purchaser of whisky at that time. Because of their buying power, distilleries were willing to extend significant credit to Pattison Elder, unaware of the firm’s precarious financial position. When they eventually went bust, many distilleries were crippled, and the whisky business moved into a period of recession. 1900: Widespread distillery closures follow the Pattison Crash, and BenRiach is mothballed after just two years of production. The distillery remains closed until 1965, however BenRiach’s floor maltings remain in constant production during this period, providing malted barley for the fully operational Longmorn Distillery. 1965: BenRiach is re-opened by Glenlivet Distillers Ltd, having been almost totally rebuilt, and production re-convenes. However, a large number of the distilleries mothballed in 1900 remain closed to this day, and in some cases have been demolished. 1978: Glenlivet Distillers Ltd, and the various distilleries under their ownership, including BenRiach and Longmorn, are purchased by Canadian whisky firm Seagrams. 1983: In addition to the regular distillation, production of peated malt whisky commences. This move is a response to the increasing cost of Islay whisky due to a general industry shortage. With no Islay distillery in their portfolio, and with peated malt a key component in Seagram’s blended whisky brands, the firm decided to produce their own peated Speyside, at BenRiach – a very unusual move at that time for a Speyside distillery. It is as a result of the stock of peated BenRiach that the previous owners laid down that we are able to bring you ‘Curiositas’, the only comercially available Speyside single malt distilled from peated malted barley. Since taking over the distillery in 2004, we have continued to distil both varieties of BenRiach; peated and non-peated. Rest assured that the future of both styles of BenRiach is secure. 1985: As production steps up, BenRiach is expanded from two stills to four. 1999: The BenRiach floor maltingsare closed, after 101 years of uninterrupted operation. The maltings remain in good working order, and could be re-activated almost immediately. 2001: Seagrams are acquired by French firm Pernod Ricard, creating the 2nd largest spirits firm in the world after Diageo. Of Pernod’s stable of distilleries, Glenlivet, Aberlour, Glen Grant and Longmorn remain at full capacity. Glenkeith, silent since 1999, remains closed and Edradour, the smallest malt distillery in Scotland, is sold to independent Signatory. Four distilleries in the Pernod Ricard group move to rotational production, distilling for just 3 months of the year; BenRiach, Allt a’Bhainne, Braeval and Caperdonich. 2002: All four distilleries are subsequently mothballed in August of 2002. 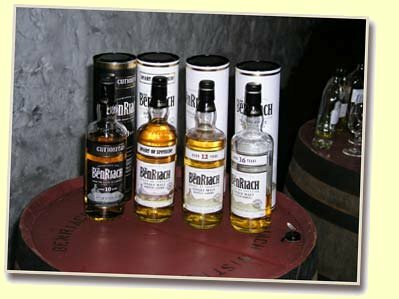 2004: In April 2004 BenRiach is acquired by an independent consortium consisting of 3 partners; Scotch Whisky veteran Billy Walker, and South Africans Geoff Bell and Wayne Keiswetter. Production re-convenes immediately, meaning the inventory is effectively uninterrupted. On the 7th August 2004 the first bottling of BenRiach under the new owners takes place; BenRiach ‘Heart of Speyside’, 12, 16 and 20 years old, and the peated 10 years old are all released to the public for the very first time. On the 20th September 2004 the first distillation under the new owners is filled to cask. 96 ‘green’ (i.e. first fill bourbon) barrels are filled, numbered 1 to 96, and are immediately transferred to the BenRiach warehouses for maturation, not to see the light of day for at least 12 years. 2005 January: The first series of official single casks bottlings from the distillery are released. Bottled in December 2004, and branded as ‘BenRiach Limited Release’, 4 vintages, from 1966, 1970, 1978 and 1984 (peated), are brought to the market. 2005 October: The 2nd series of ‘BenRiach Limited Release’ single cask bottlings are liberated, with 7 vintages, from 1968, 1972, 1975, 1976 (peated), 1979 (peated), 1986 (peated) and 1988, launched. These were bottled in September 2005. BenRiach also launch ‘Authenticus’, aged 21 years and distilled from peated malted barley. The bombastic older sibling to Curiositas, this is the 2nd peated expression from BenRiach. As a peated single malt from Speyside, and with annual production limited to 800 six-packs, this is a rare whisky indeed. 2006: The 3rd series of ‘BenRiach Limited Release’ single cask bottlings are liberated, with 8 vintages, from 1968, 1972, 1975, 1976 (peated), 1978 (classic speydide), 1980 (new wood), 1984 (olososso sherry peated) and 1986 (fino sherry peated), launched. These were bottled in June 2006. 2007 August: The 4th series of ‘BenRiach Limited Release’ single cask bottlings are liberated, with 8 vintages. “In addition to our various expressions (classic Speyside style, heavily peated BenRiach, wine finishes) we also have some small quantities of triple-distilled BenRiach. Some of this was produced by Chivas back in 1998, and we also ran a small trial ourselves in Feb 2007. Both vintages have been filled into 1st fill bourbon casks, although we do plan to re-rack the 1998 into 2nd fill sherry casks for a period of time. Eventually these will be released as a triple distilled BenRiach bottling. The first think I did, after arriving to Glasgow, was, to buy all the 2nd series of ‘BenRiach Limited Release’ single cask bottlings, I could get, for our WCoA Club Tasting back in Vienna.